Manchester United goalkeeper Edwin van der Sar completed 90 minutes for their reserves against Everton as he stepped up his comeback from injury on Tuesday. The 38-year-old Dutchman has not appeared for United since breaking two bones in his left hand against Bayern Munich in the Audi Cup on 5 August. 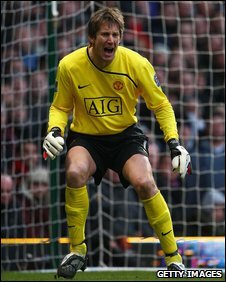 Van der Sar showed no discomfort during the reserve game, although he was rarely called on in a quiet contest. Italian striker Federico Macheda scored the decisive goal as United won 1-0. Van der Sar, winner of three Premier League titles since joining from Fulham in 2005, will compete for a place with Ben Foster, who has struggled for consistency in his absence. United's defence has lacked experience in recent weeks with Van der Sar on the sidelines and captain Rio Ferdinand struggling for fitness. Foster was at fault for Gareth Barry's goal in the Manchester derby and allowed Kenwyne Jones to beat him to a high ball and nod Sunderland 2-1 ahead at Old Trafford on Saturday. Should Van der Sar walk straight back into the United side? United have said Foster's exclusion from the England squad for the qualifiers against Ukraine and Belarus is because of a chest injury, rather than loss of form. Van der Sar set a British top-flight record by going 1,311 minutes without conceding a goal last season. He is now expected to make his first-team return against Bolton following the international break on 17 October.